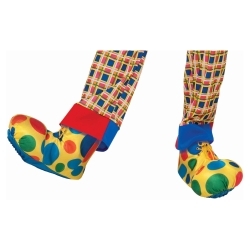 These soft fabric clown shoe covers are a great alternative to pricy clown shoes. They give you the look of oversized bright and colorful clown shoes at a fraction of the price. But don’t worry we are still carrying our whole line of deluxe quality clown shoes as well! These soft clown shoe covers will fit up to a size 13 foot using the attached elastic band.